CarPro Reset was formulated as the perfect partner to nanotechnology based sealants and coatings, with cleaning properties tailored to their unique needs. Utilizing Intelligent pH Surfactants, Reset breaks down road grime and traffic films with the power of an alkaline cleaner, whilst being as gentle on the surface as a pH-neutral shampoo. Afterwards Reset quickly rinses free from the surface, leaving behind no soap residues or interfering silicones, and restoring the beading and dirt releasing properties (The 'Hydrophobic Effect') of the surface to help maintain its protection. 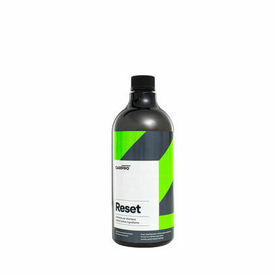 Combined with excellent lubrication, a strong foaming action for improved dirt suspension, and a high dilution ratio, this makes for a highly effective and economical wash. At the same time, Reset is almost entirely based upon naturally occurring, organic ingredients, making it as safe for the environment and for the user as it is for the vehicle. If dirt is hiding the beauty of your car or motorcycle, then you know that it is time for a Reset! 1. Fill wash bucket (with 3 to 4 gallons) of water and add approximtely 1 to 1.5 oz. of Reset as the bucket fills to mix the shampoo solution and activate the foam. 2. Pre-rinse vehicle with free flowing water to remove loose debris, and wash out of direct sunlight from the top down using ourCarPro Merino Wool Wash Mitt , rinsing the mitt/sponge periodically in a second bucket filled with clear water. 3. Do not allow shampoo to dry on the surface! After washing, rinse the vehicle thoroughly with free flowing water to remove shampoo residue, and dry with a PCF Blue drying towel or forced-air blower. 4. If necessary, use CarPro Spotless to remove hard water spots, and apply either Reload or Hydro2 to top-up the vehicle's protection.